The Blackhawk! Day Planner Holster is available in small and large sizes to accommodate your choice of carry gun. We’ve been testing the large model which has been able to handle all of our full size handguns like Beretta 92s, full size 1911s, full size Glocks, and more. The Blackhawk! Day Planner Holster – a nifty way to hide your gun in plain sight. The case itself is dedicated to the gun and a spare magazine. There are no compartments for office supplies. This makes sense as you don’t want to be opening this case unless you really, really, need to. From the outside, it’s just an ordinary day planner. The day planner features a dual zipper design, so you can configure it to open from either end. Or, keep both zippers centered if you prefer. The two zipper design is important as it allows you to configure the unit specifically to your needs. You can decide on specific orientation of your gun in the case, and which side you want for primary access. Every time you open the day planner, your gun will be oriented in a consistent direction. The case itself is made from 1000 denier CORDURA® nylon outer material, whatever that is. The important thing is that the material is sturdy and tough. This day planner is not going to wear out until long after the Housewives of Los Angeles stop pole dancing. It also features a form-fitting canvas strap across the spine. It’s just big enough to get your fingers through, but small enough that it doesn’t flop around and catch on things. The gun is retained by an adjustable strap that attaches to the velcro backing. Did I say velcro? Sorry, I meant to say hook and loop. That’s what all the tactical folks call velcro these days. This strap is made from thick canvas-like material and is adjustable to fit different pistol widths. This band is wide enough to cover the trigger guard area of your pistol or revolver and hold it firmly in place. There is an adjustable elastic cord that can go around the grip or rear of the slide to keep your gun solidly tucked in to the band. A separate velcro-backed piece with an elastic loop is used to secure a spare magazine. Both components are velcro (hook and loop, right?) backed so you can place them independently wherever you like. Just place each in its desired location, test your placement and access with an unloaded gun, and you’re ready to go. Do NOT leave this behind in the conference room! Staple the carry strap to your hand if you need help remembering! If you’re the church going type, and it’s permitted in your locale, this makes a great Sunday go to meetin’ carry method as the day planner looks very much like a bible case. Just sayin’ you know? 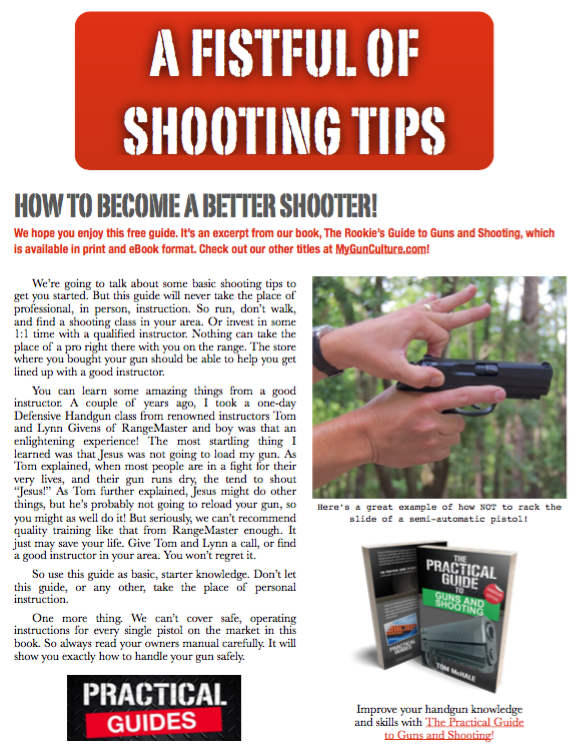 More gun holster info in our book, The Insanely Practical Guide to Gun Holsters! Get the Amazon Kindle edition! Get the Barnes & Noble Nook edition!